Foosball tables make up for great options when it comes to having fun indoors, be it at your home, office, club or a pub. Playing a Foosball is fun, works as stress reliever, and enhances your quick response abilities as you play. It does not even take up a lot of space. In addition, whenever you feel like you need a change, you can just get up and play foosball. Besides, it is not a bad decision to add a foosball table to your interiors, unless you do not know how to play. 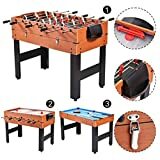 #1 Why You need 3 in 1 Foosball Table? 1) Saving Space — buying three different tables for three different games might take up a lot of space in your room. Combination tables allow you to play different games like Pool, Air Hockey, Table Tennis on the same table, hence saving the space for you. 2) Saving Money — if you want to play foosball, but you also like playing shuffle, or say, your brother wants to buy a pool table. Now all of that is going to cost you a fortune. Nevertheless, combination tables are comparatively cheaper and you can save a lot of money. 3) Add-on in the Interior — foosball tables look colourful and are a pretty sight anywhere. It might just add that extra pop in your room and give an aura of that sporty vibe. Some vintage foosball tables look very classy. There are hundreds of options for foosball tables in the market. Many variations in prices and designs, and variations in weight, etc. are available. Are you confused as to which foosball table to buy? Are you looking for a guide to help you through? Worry not, for we have you all covered! IFOYO Multi-Function Combo Table is a stylish, high quality and sturdy table that can be placed easily anywhere in the house as it takes up very little space. It weighs only 51.15 lbs, which makes it easy to carry from one position to another. It also consists of an MDF constructed cabinet. It is easily operable and easily assembled. Hence, it makes a perfect Christmas gift for kids. 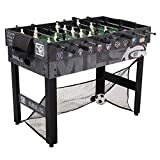 This Foosball table comes with Dimension of 48″x 24″x 32″(L*W*H) & also with Hockey Table, Table Tennis Table & Pool Table. IFOYO is a trusted brand when it comes to sports equipment. They are very durable and include warranty periods with all of their products. Currently, 16 customers on amazon have rated it 4 out of 5 stars on an average. This is the best 3 in 1 Foosball table recommended by us when it comes to the look and feels as well as durability. This Lancaster table allows you to play three games on a single table. It weighs 61.3 lbs, which is neither too heavy nor too light. The speciality of this table is that it allows you to switch from one game to another in seconds. It also has side locks on both the sides so as to stabilise the table in position. It also has manual scorers on both the sides. This Foosball table comes with Billiard Table & Slide Hockey Table. Lancaster is a known and popular sports equipment brand sold and purchased widely all over the world online as well as offline. Currently, 17 customers on amazon have rated it 4 out of 5 stars on an average. This table is highly recommended by us, the texture and colour is lovely, everything about this table is just too cool. The NEW 3 in 1 combo table allows you to play three unique games on it — billiards, slide hockey and soccer. This table is very sturdy and has ½-inch steel rods with robot-stylised players on both the sides. 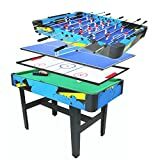 Easily convertible and easily assembled, it comes in a package, which includes various accessories of billiards and soccer: cue sticks, soccer balls, chalks, triangle, ball sets, pucks, pushers. It weighs 61.6 lbs and also includes a 90-day manufacturer’s warranty. NEW 48″ 3 in 1 combo table makes up for an amazing foosball table and works as an add-on in the interior of the room. Currently, two customers on amazon have rated it 5 out of 5 stars on an average. 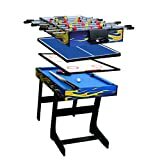 Fat Cat 3 in 1 Flip game table is super compact and uniquely stylish. 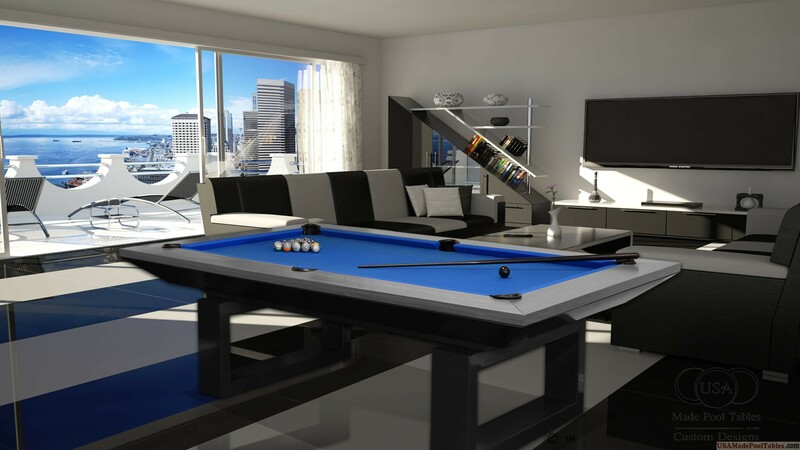 It offers a combo of Air Hockey Table, Pool Table and Table Tennis Table not a Foosball Table. It is made up of durable engineered wood and weighs 195 lbs, which makes it super sturdy. The package also includes all the accessories required for these games. Fat Cat is a popular icon among the teens. One good thing about the sports equipment of this brand is that there is a large range of really affordable stuff and they come in all variations, colours and sizes. Currently, 22 customers on amazon have rated it 3.5 out of 5 stars on an average. Giantex Multi Game Table is the perfect investment if you are indecisive like most of us and want to play different games on different occasions. It is constituted of sturdy steel rods with robot-stylised players and weighs 45 lbs, which makes it easy to carry and move even by the kids. 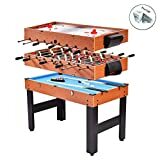 This 3 in 1 Foosball Table comes with Pool Table & Air Hockey Table & each of them have quite different dimension which You should check before purchasing. Giantess has a huge range of products in all prices and their combination tables are great in terms of durability and sturdity. Currently, it is a bestselling product on amazon and 49 customers have rated it 3.5 out of 5 stars on an average. This edition is highly recommended by us. 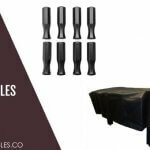 The combos provided are perfect and the overall durability is really good even though the product is the lightest on available in the market. Triumph MLS Trifecta 3 in one table offers an interesting combo of foosball, soccer and Air Hockey. It weighs 49.1 lbs and is fairly sturdy. The package also includes miniature soccer balls, soccer style foosballs and soccer net. The table has ergonomic grips, a slide scoring system and leg levellers. Products of Triumph are very reliable and pocket friendly. They have achieved great popularity and have been one of the oldest players in this market. Currently, four customers on amazon have rated it two. Out of five stars on an average. This combo table has a classy wooden look and super stylish appearance. It weighs 55 pounds and gives a sturdy feel while playing. Lightweight, still manages to be sturdy enough to allow a smooth gameplay experience. This Foosball Table comes with Pool Table & Air Hockey Table. Evelove Products are sold and purchased widely online and offline. This brand has managed to hold a reputable position in the market with its quality products. Currently, 16 customers on amazon have rated it 4 out of 5 stars on an average. This combo table is one of the newest arrivals in the market. The speciality of this design is the pop of colour that it highlights. It looks stylish and attractive. It weighs 61.7 lbs and is constituted of high quality durable components. This Foosball Table comes with Pool Table, Table Tennis Table & Air Hockey Table too. Size of this Table is 47.2″ X 24.0″X 33.5″, Soccer Table Size: 41.3” X 22.8”; Pool Table Size: 43.0” X 19.8”. 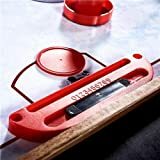 Pinty Products have great reputation in the market for being super pocket friendly on the same time being fairly durable. Currently, 30 customers on amazon have rated it 3.5 out of 5 stars on an average. 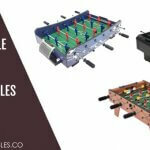 This three in one combo table is a cool compact edition of foosball tables. It includes gaming accessories required for billiards and soccer. This table is very lightweight and weighs only 45 lbs, still managing to be sturdy enough for an efficient gameplay. This Foosball table have Air Hockey Table & Pool Table too. This combo table is another new arrival in the market, which sports re-enforced legs for additional durability and sturdiness during gameplay. The package includes all the accessories required in billiards, soccer as well as hockey. 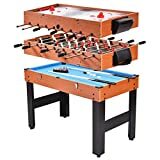 This 3 in 1 Foosball Table Offers Pool Table, Foosball Table & Pol Table. This table is designed for increased sturdiness and enhanced durability with re-enforced legs, storable and hinged table tops for easy storage and conversion. It includes combination of billiards, hockey and soccer and weighs only 45 lbs. the package includes all the necessary accessories. 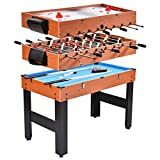 This table having a dimension of 48.5″ X 22.7″ X 32.5″( (LxWxH) & comes with Pool Table, Foosball Table or Air Hockey Table. This cool combo table is a great addition to your interiors. It is compact yet sturdy, stylish yet durable, colourful yet classy. It comprises of a combination of billiards, soccer and glide hockey. The package includes all the necessary accessories. The table weighs only 45 lbs. 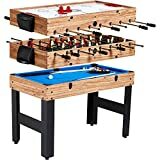 If you are considering buying a foosball table, I would suggest you prefer combination tables to the classic single game tables. There are many alternatives and there are certain things you should take note before purchasing a foosball table. You can select one of the various options available online based on your preferences according to your budget, size of the table, foosball dimensions, look and feel, colour variations, etc. you can also visit the sports equipment markets in your locality and check out certain editions offline, if it makes decision-making easier for you. 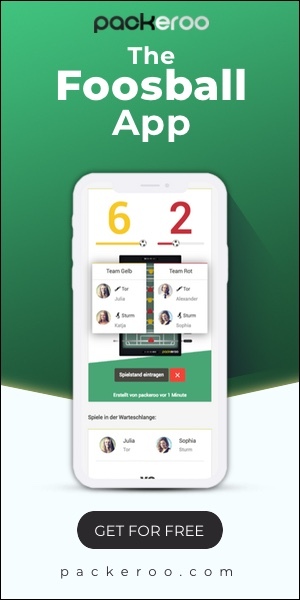 However, before you start playing, you should learn foosball rules properly and might as well explain them to your friends to amplify the gameplay experience. Previous article Where to Find Foosball Table Parts?